Leave your nail bed looking healthy and neat! Sharp 1/4 jaw cutting edge cuts cuticles with accuracy with a smooth cutting motion. 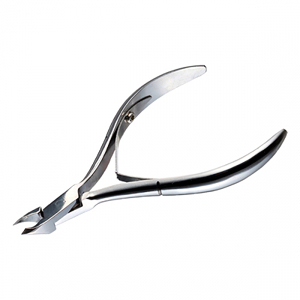 This professional 1/4 Jaw Cuticle Nipper makes cutting and cleaning cuticles easy! It's double spring action for smooth cutting motion, comfortable ergonomically designed handle, and sharp 1/4 jaw tip allows for a superior cuticle nipping job! Used by nail professionals, this cuticle nipper has a long shelf life and remains a must have tool for your nail grooming needs.